More change afoot as Jordan Waugh and Tim Langmead at Camper & Nicholsons take over the central listing for sale of the classically styled 39m sailing yacht Renaissance. 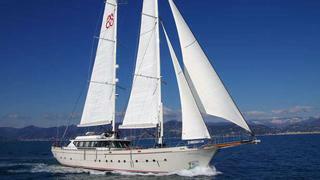 Built in wood, she was launched in 2012 by Costruzioni Navali Tigullio – Castagnola based in Lavagna, Italy. Her hull was built in Turkey under Italian supervision and then moved to Italy for completion and outfitting at CNT – Castagnola. A team of renowned Italian naval architects and designers joined together to bring this project to fruition. These included Silverio Della Rosa for the naval architecture and sail plan, Studio Faggioni for the structural plan, Venelli & Kramer for the deck and exterior design, and Nauta Yacht Design for the interior design. Renaissance accommodates 10 guests in a full-beam master, two double and two twin staterooms. The crew quarters for four crew members are located aft, with a large galley. Two extra crew cabins are available in the bow with access from the forward deck. The yacht features a beach club with sauna and an aft hydraulic swimming platform. Renaissance is powered by twin 460hp Caterpillar engines giving a top speed of 12 knots, a cruising speed of 10 knots and a transoceanic range of 5,000 nautical miles. Still under yard warranty, the price of Renaissance is available on application.